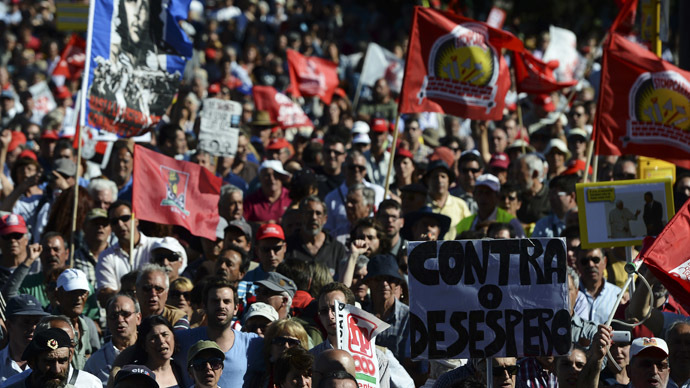 Debt-ridden Portugal approved Tuesday a harsh austerity budget for 2014 as thousands protested against the measure, with some demonstrators entering ministry buildings and the parliament. The ruling center-right coalition, which holds 132 of 230 parliament seats, overrode left-wing opposition to adopt the budget, which intends to save 3.9 billion euros (US$5.3 billion), in part by cutting public sector salaries and pensions. The adopted budget would cut civil servant wages by between 2.5 and 12 percent for earners of more than 675 euros per month ahead of taxes. Public pensions worth more than 600 euros per month would be cut by 10 percent. The age for getting a full pension would also go up to 66 from 65 as it is now, and spouse pensions would be means-tested. Thousands of protesters gathered outside parliament chanting “government resign!” and “enough of these crooks!” as the vote occurred, AFP reported. Another 200 protesters entered entrance halls of the ministries of finance, economy, health and environment. "It's time for the government to go," demonstrators cried at the Finance Ministry. Portugal’s 78-billion-euro (US$104 million) bailout in May 2011 - to end in June 2014 - by the International Monetary Fund, European Commission and European Central Bank demanded Lisbon enact austerity reforms in exchange. Tough cutbacks are blamed for worsening the recession and hiking the unemployment rate, which was recently 16.3 percent, according to FactSet Research. 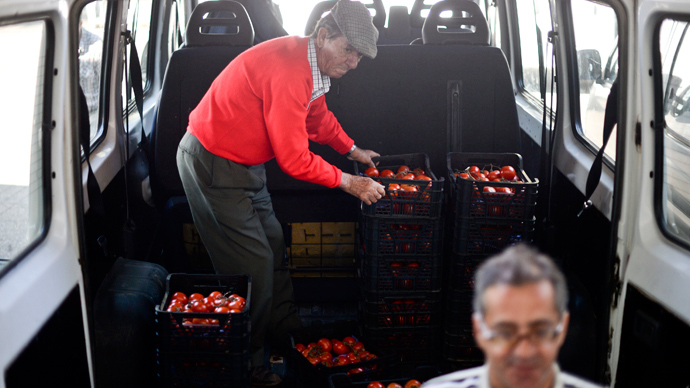 Portugal’s jobless high was 17.7 percent in the first quarter of 2013. 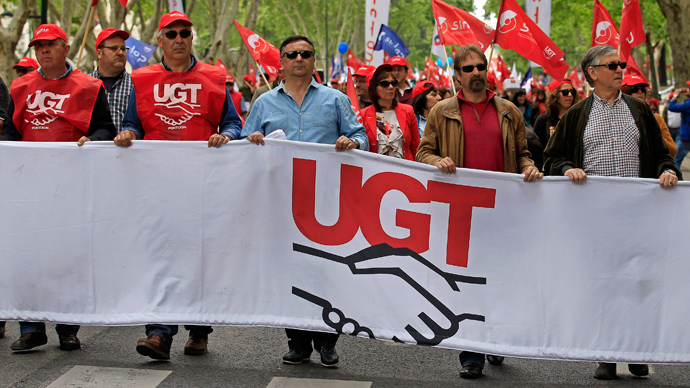 The austerity measures amid a deepening economic crisis have sparked mass protests, causing a political crisis over the summer that Prime Minister Pedro Passos Coelho’s coalition government narrowly escaped. "The 2014 budget is a decisive step for Portugal to recover its financial autonomy," Finance Minister Maria Luis Albuquerque stated during the parliamentary debate, saying it was crucial to the country being able to borrow from financial markets once again in mid-2014. 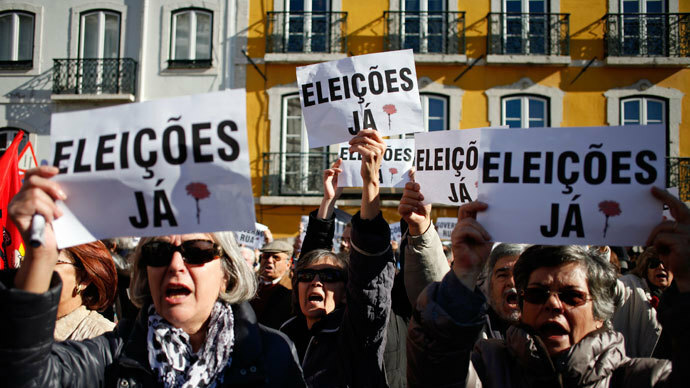 Isabel Quintas, a 61-year-old retired civil servant attending the protest outside parliament, said: "Even if this rally does not change the outcome of the vote, it is important for the government and lawmakers to know the Portuguese are against these measures." The budget still needs approval from the Constitutional Court, which triggered a political crisis once before by rejecting tax measures intended to meet bailout terms, and is due to rule in the coming weeks on the proposed civil servant wage cuts. Bad bonds: Is Portugal the next Greece?